One of the most frequently asked questions from a physician learning Prolotherapy is “how do you know what and where to inject?” The book Principles of Prolotherapy by Thomas H. Ravin, MD, Mark S. Cantieri, DO, FAAO, and George J. Pasquarello, DO, FAAO provides this information! The book is extremely well written and can be easily understood by both the expert physician and the lay person interested in Prolotherapy. The book is produced in four color and most points are wonderfully illustrated. The book begins with an introduction to Prolotherapy and explains in great detail the wound healing and tissue repair cascades. The authors explain clearly that Prolotherapy is the purposeful iatrogenic stimulation of the body’s capacity to heal wounds and repair injured tissues. Prolotherapy stimulates healing of ligamentous laxity, chronic enthesopathy, or tendinosis, by initiating an acute inflammatory response. This is then illustrated by light microscopy photographs of a sacroiliac ligament pre and post Prolotherapy. 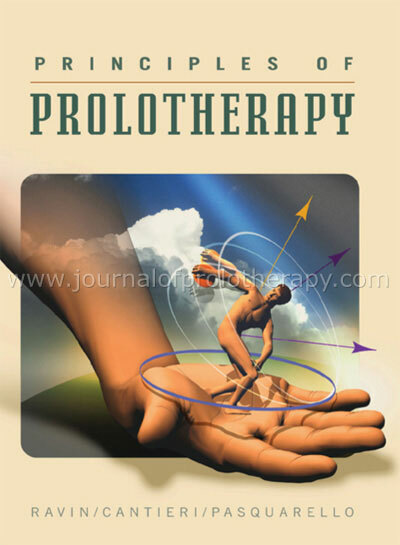 The authors of Principles of Prolotherapy all have clinical practices in which they also perform manipulation. They are well-known instructors and possess an immense knowledge of anatomy, which is evident in the book. The chapter on postural models makes the reader realize how the whole body is influenced by its various parts. They explain that “in Prolotherapy, the use of the degenerative postural cascade model can help predict when and where ligaments will commonly fail.” Injury to one ligament, such as the iliolumbar ligament in the lower back, they illustrate, can lead to all kinds of muscles tightening in the lower back and pelvis leading to increased thoracic kyphois, increased cervical lordosis, and rotation at various transitional junctions in the spine. Based on this model, the treatment of ligament laxity is as critical to restoring function as the reestablishment of muscle tone, fascial balance, and biomechanical integrity. The majority of the chapters in the book are divided into the various body parts, including the cervical spine and temporomandibular joint, thorax and rib cage, shoulder, elbow, wrist and hand, lumbosacral spine, pelvis and hip, knee, and ending with ankle and foot. The book is filled with extremely detailed and colorful anatomic illustrations showing all the pertinent anatomy, along with where to inject and where not to inject. The book does a nice job of illustrating where the various nerves are located in relation to the ligaments and structures where the Prolotherapy injections are reaching, so as to avoid them. For the doctor just beginning to add Prolotherapy to his/her practice, the sections on anatomical danger zones should be well-appreciated! Figure 1. Photograph demonstrates the FABERE test of the right hip. Figure 10-18 from Principles of Prolotherapy. Used with author permission, 2009. Figure 2. Photograph shows palpation of the proximal adductor tendons. Figure 10-19 from Principles of Prolotherapy. Used with author permission, 2009. Principles of Prolotherapy clearly illustrates the various ligaments and their referral pain patterns which can be seen in Figure 3. Figure 3. 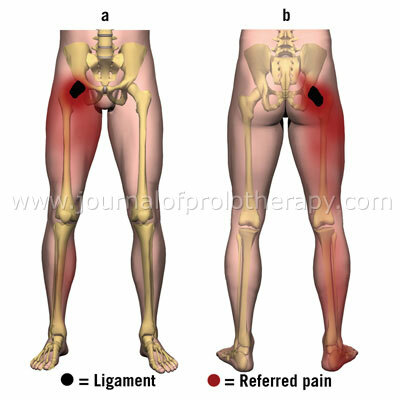 Image illustrates referred pain patterns from the anterior (a) and posterior (b) hip capsule ligaments. Figure 10-10 from Principles of Prolotherapy. Used with author permission, 2009. Figure 4. Photograph shows the injection technique for the posterior hip capsule. Figure 10-35 from Principles of Prolotherapy. Used with author permission, 2009. Figure 5. Photograph shows the injection technique for the lateral hip capsule. Figure 10-36 from Principles of Prolotherapy. Used with author permission, 2009. These illustrations are the best I have ever seen to show the patient, as well as both the experienced and novice Prolotherapy physician, what structures are injected with each of the various Prolotherapy injections. For the physician desiring to truly know how to accurately diagnose the cause of their patients’ pain and how to document that by physical examination, Principles of Prolotherapy offers a truly comprehensive and illustrative explanation. For both novice and expert physicians utilizing Prolotherapy in their practices, Principles of Prolotherapy is a much-needed guide illustrating the injected structures, as well as how to safely perform these injections. For anyone involved in Prolotherapy, especially the physicians using the procedure in their practice, the book Principles of Prolotherapy is a must-have. It is a book that will stand the test of time and be used for generations to come.